The EUETS stands alone in not managing price – time to change? The EUETS stands alone in currently excluding any element of price management from its basic design. In this respect it can learn from other schemes. The current debate on whether the backload the sale of EU allowances is in many ways a distraction from the more important issue of structural reform. The Commission’s review of the EUETS published last year mentioned price management as an option for structural reform (Option f in the document)i. I have previously talked about the way in which carbon pricing lies on a spectrum between pure emissions trading and pure taxes (27th March 2013), and looked at the role of floor prices in emissions trading schemes (2nd May 2013). In the context of the current debate on EUETS reform it seems worth further emphasising how exceptional the EUETS is in not already including some element of price management in its design. Every other carbon pricing scheme in the world contains some element of price management or fixed pricing, or (for those schemes still being designed) seems likely to put something in place, with the only possible exception I am aware of being Kazahkstan. The measures that have been introduced or are being considered – floors, ceilings, market interventions, and carbon taxes – are summarised in the table at the end of this post. There will of course be political challenges in negotiating the form and level of any price thresholds in the EUETS, with some eastern European member states likely to favour lower values than some in western Europe. But whatever form and level of price containment in the EUETS proves achievable, the presence of such mechanisms in every other scheme in the world surely at least warrants a close look at how such mechanisms might benefit the EUETS. The EUETS was a pioneering scheme, and other schemes have learnt much from it. Now other schemes are up and running, and the EUETS can learn from them in return. And one of the things it can learn is that price containment mechanisms are an appropriate component of emissions trading schemes. British Columbia Carbon tax fixed at C$30 May adopt emissions trading in future as part of WCI, but does not appear likely at present. This entry was posted in carbon price floor, carbon pricing, Climate change policy, emissions trading, international comparisons and tagged carbon pricing, carbon taxes, climate change, climate change policy, emissions trading, emissions trading scheme, floor prices on 26/06/2013 by adamwhitmore. Will carbon pricing in China be regional or national? Regional differences are already an important feature of carbon pricing in China. These differences seem unlikely to stop the emergence of carbon pricing across the country, but prices and scheme designs may continue to vary between regions for many years. Something may emerge with characteristics between the complete integration of the EUETS and the diversity of provincial schemes in Canada. Policy developments in China, the world’s largest greenhouse gas emitter, are critical to global prospects for limiting climate change. The trial emission trading schemes being implemented in seven provinces and cities, accounting for around a quarter of the economy, are, taken together, by far the world’s largest carbon pricing system, after the EUETS. However wealth and economic structure are very different across China. The seven trial schemes are in the richer eastern and central parts of the country, with as yet nothing equivalent in poorer provinces. 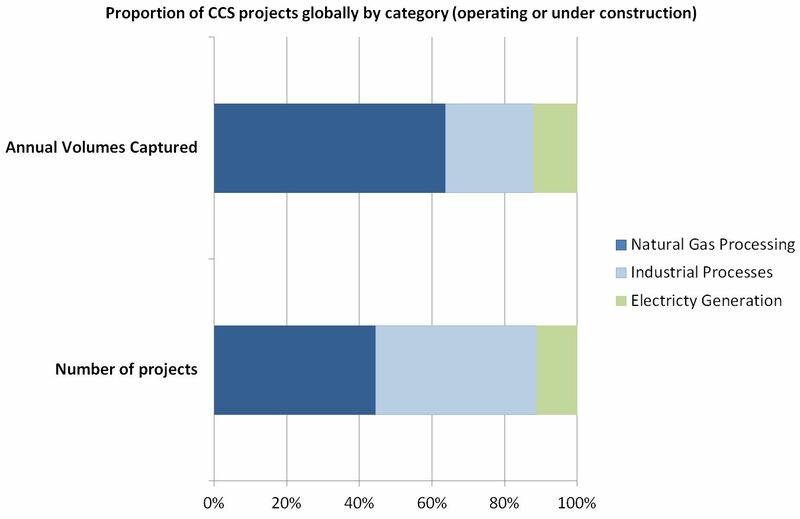 This raises the question of whether economic diversity will be a barrier to establishing national carbon pricing in China. A unified emissions trading scheme might prove possible despite differences in wealth. 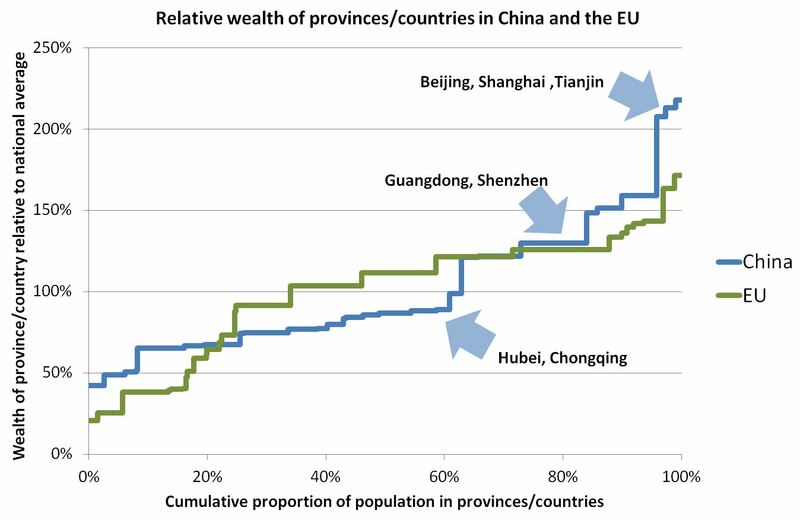 The chart below compares the percentage variation in GDP per capita across the twenty-seven countries in the EU with the thirty-one provinces in China in 2030 (see note below chart for details). The variation between rich and poor countries in the EU is substantial. The three richest countries (Denmark, Sweden and the Netherlands) have per capita incomes around 4.8 times those of the three poorest (Bulgaria, Romania and Poland). The range of incomes among China’s provinces is slightly smaller, with the three richest provinces, the cities of Tianjin, Shanghai and Beijing, having incomes around 4.5 times those of the three poorest (Gansu, Yunnan and Guizhou). However the variation in the middle of the income range is greater in China. Thus, very broadly, the variation in incomes across China is comparable to that across the EU. As it has been possible to establish and maintain a unified emissions trading scheme across the EU with its diversity of income then it may be possible to establish something similar in China. The countries/provinces are arranged in order of increasing GDP per capita. The horizontal axis shows the cumulative proportion of the population in countries/provinces with GDP per capita below a certain level, relative to the national mean per capita GDP (population weighted average across provinces/countries). The vertical axis shows the relative GDP per capita of countries/provinces. The blue arrows indicate the positions of the Chinese provinces with trial ETSs. Data sources are World Bank and China NBS Database. Data for China is for 31 provinces (taken to include the 22 provinces – Taiwan being excluded – 5 autonomous regions and 4 municipalities). Hong Kong and Macau are excluded. Data for the EU is for the 27 Members States. Data is for 2011 in both cases. Furthermore, emissions trading creates the potential for transfers of wealth from richer to poorer provinces. If richer provinces in China have more demanding emissions caps they may buy in allowances from the less prosperous provinces, transferring funds in the process. Such differences in stringency may to some extent resemble the EU’s burden sharing agreements. Wealth transfer may stimulate further economic integration and convergence, especially if there is also a transfer of administrative infrastructure and capabilities to less developed provinces as part of the process of building a national scheme. These considerations lend credibility to a scenario in which there is a single national scheme with uniform prices, but different stringencies of cap in different provinces, and perhaps different allocations of allowances to industry and other sectors across different provinces. Coverage of sectors and facilities may also vary between provinces. Canada is the clearest example of distinct regional pricing in a single country. Despite total 2011 emissions in Canada being only about 6% of China’s, Canada has three separate provincial carbon pricing schemes (British Columbia, Alberta and Quebec), with other provinces currently considering what, if anything, they might implement. Any unification of these schemes seems a distant prospect. Although British Columbia is, like Quebec, a member of the Western Climate Initiative it does not currently appear to be moving towards introduction of an ETS. Among the barriers to unification of carbon pricing are the different economic structures and resource bases of Canadian provinces, for example hydropower rich Quebec contrasting with fossil fuel rich Alberta. Similarly, differences in the economies and resource endowment of provinces across China may create persistent barriers to full integration of emissions trading schemes, although there may be greater commonality of design than between the Canadian carbon pricing schemes, which are notably diverse in their approaches to pricing. Whichever model it chooses it seems clear that China is pursuing carbon pricing as an important component of its emissions reductions programme. Carbon pricing will surely spread across the country. And there may well be much in common between regional schemes, and increasing linkage. But although a national price may emerge in the next few years it also appears possible that pricing could remain diverse for many years to come. This entry was posted in carbon pricing, Climate change policy, emissions trading, international comparisons and tagged carbon pricing, China, emissions trading, emissions trading scheme on 17/06/2013 by adamwhitmore.